A very easy care perennial, Plectranthus ecklonii will brighten up a shady corner of the garden in late summer to autumn. Masses of purple or perhaps ‘violet blue’ flowers and pale green foliage on an easy care plant. Originally from South Africa, P. ecklonii grows naturally in wooded areas. This is an evergreen shrub like plant reaching 2m plus, it is best suited to part shade and can be used to underplant species such as Brugmansia. Although P. ecklonii is reputed to be drought tolerant, it does perform better with a little moisture in summer. Plant P. ecklonii in part shade or afternoon shade, best when planted amongst other shade loving perennials beneath taller plants that provide dappled shade. This is a fairly upright perennial and adds a little height to a cottage garden situation. Fertilise in spring after pruning. Mulch to maintain a cool root run and a moist soil. Also suited to growing in containers in a shaded position. P. ecklonii ‘Hawthorne Pink’ is an attractive form that has pink flowers. P. ecklonii alba – White flowers as the name suggests, excellent contrasting form in shade. Height – To 2.5m however easily pruned. Spread – To a width of 2m. Position – Full sun to part shade, better in afternoon shade, or afternoon dappled shade. Soil – Humus rich, well drained with some moisture. Although P. ecklonii will cope with poor soils. Flowers – Violet blue in cone like sprays. Flowering time – Late summer through autumn. Frost Tolerant – No. Mild frosts only. Plectranthus ecklonii is best pruned back fairly hard in spring as signs of new grow appear. 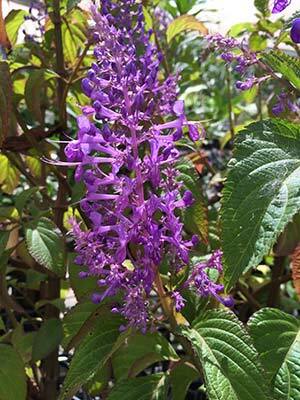 Plectranthus ecklonii is available for sale from the following participating nurseries.